The Santa Barbara Zoo is one of the few places beyond the Channel Islands where you can see an endangered island fox. The island foxes at the Santa Barbara Zoo were the first to breed in captivity on the main land and the zoo has been very involved with the National Park Service and the Nature Conservancy regarding captive fox husbandry on the islands. Come and see the island foxes enjoy some of their favorite food–insects. Learn about the challenges the fox faces in the wild. And have fun with fox crafts, face painting, and other activities. What can you do to help the island fox? Friends of the Island Fox will be raising money to provide funds for fox radio collars. Each island fox returned to the wild on San Miguel, Santa Rosa, and Santa Cruz Island must have a radio collar so biologists can monitor its activity and survival. Radio collars cost $250.00 each. Every little bit we raise will help to see that another island fox can be released back into the wild. You also can be an ambassador. The more you know about the Channel Islands and the island fox, the more you can spread the story and help us Save The Island Fox. All Fall Fox Festival activities are included with the price of Zoo admission. Come out and join us Sunday, October 2 (11 AM - 3 PM) and MEET AN ISLAND FOX. The island fox (Urocyon littoralis) lives on six of the eight California Channel Islands. Each island’s fox population is unique and identified as its own subspecies. For example: the foxes on San Nicholas Island have more vertebra in their tail than the other island fox subspecies. The island fox is one of the smallest members of the dog family, or canid species, in the world. They are about the size of a housecat–weighing from four to five lbs. and standing only 12 to 13 inches high. They are 20% smaller than their closest relative, the mainland gray fox. The tiny island fox actively seeks food during the early morning and evening, as well as at night. Their diet consists of native fruit, vegetation, mice, insects and crabs. Male and female island foxes come together as a pair between December and January. They typically form a lifetime monogamous relationship and mate early in the spring. One to five pups are generally born between April and May. The pair raises their family together, providing a protective den, hunting for food and eventually teaching their offspring to be self-sufficient. By September, the pups are ready to be on their own and the family splits up. In recent years, the foxes have almost disappeared on the northern islands of San Miguel, Santa Rosa and Santa Cruz. In 1994, San Miguel was home to approximately 450 foxes. By 1999, only 14 foxes remained–a 97% decline. In hopes of saving the island foxes, four of the six subspecies were listed as endangered under the U.S. Endangered Species Act in 2004–the populations on Santa Catalina Island, San Miguel Island, Santa Rosa Island and Santa Cruz Island. WHY HAVE THE ISLAND FOXES DECLINED? 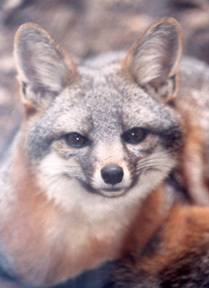 In 1994, the National Park Service recognized a large decline in island fox populations. Park biologists studied disease, predation and environmental factors, but could not explain the reason for the decline. Then a pattern began to emerge. In a two-year period, 21 out 29 dead foxes had been preyed upon. In the fall of 1998, eight foxes were radio-collared for a telemetry study to monitor their movements. In just a few months, half of these foxes were attacked. The culprit was identified by a long feather left beside a fox carcass–a golden eagle feather. Historically, bald eagles had occupied the islands. Being territorial, they had limited the number of other large predatory birds. As predators of fish and sea birds, bald eagles did not prey on the island fox. Our national symbol disappeared on the islands in the 1950s and 60s due to the effects of DDT. Bald eagles ingested the pesticide DDT in local fish and laid eggs with very thin shells. Because the eggs broke before hatching, the bald eagles could not successfully reproduce and went extinct. In the absence of the bald eagle, the golden eagle was attracted to the northern islands by an abundance of wild, or feral, piglets on Santa Cruz Island. The golden eagles also soon discovered the easy-to-catch island fox. The tiny foxes had never known a predator. In contrast to the mainland gray fox, the island fox may forage openly by day so is easily spotted by a hunting golden eagle. The protective cover once provided by chaparral and native plants had been eaten away by the many introduced animal species during the years of ranching on the islands. In a short time, golden eagles decimated the northern island foxes. On Santa Catalina, the island foxes faced a different danger. An outbreak of canine distemper contracted from a local domestic dog caused their numbers to decline from 1,342 in 1994 to 165 in 2000. Today, captive breeding and a restored native habitat are vital to saving the endangered island fox.